Primary splenic angiosarcoma is a rare malignant vascular neoplasm of mesenchymal origin. The tumor is highly aggressive and has a high metastatic potential. It is usually diagnosed on histopathological examination of splenectomy specimen. Only few cases of angiosarcoma diagnosed by fine-needle aspiration (FNA) cytology alone have been reported in the literature. The cytologic features of angiosarcoma are heterogeneous, however, diagnosis can be suggested by FNA when vasoformative features are present. A 55-year-old female presented with abdominal pain and hepatosplenomegaly. Computed tomography scan revealed a heterogeneous splenic lesion with liver metastases. FNA from the splenic and liver lesions showed moderately pleomorphic tumor cells closely associated with anastomosing vascular channels. Cell block immunocytochemistry (ICC) showed tumor cells positive for CD31, CD34, CD68 as well as for CD99. 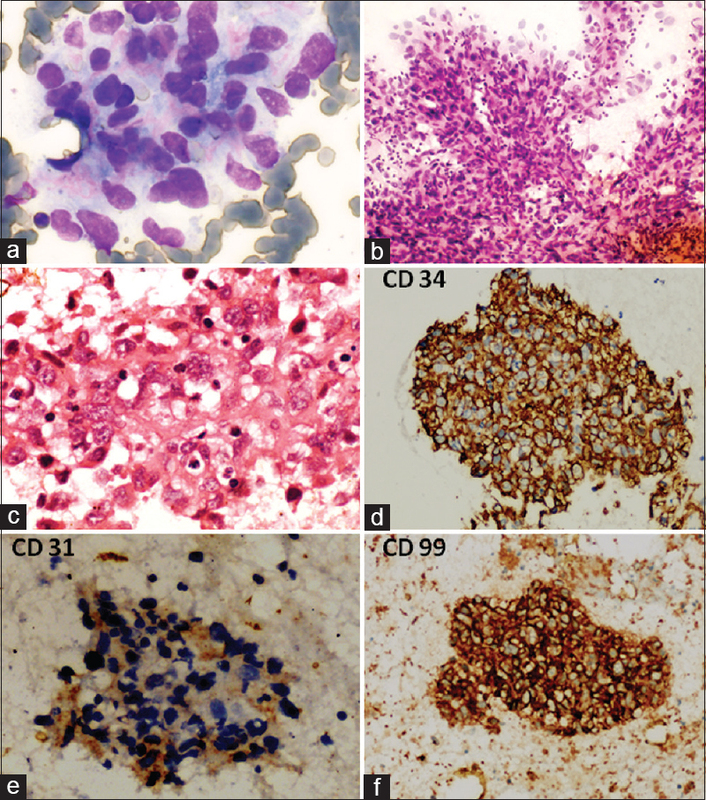 FNA supplemented by cell block ICC can render a definite diagnosis of primary splenic angiosarcoma with liver metastasis. Primary splenic angiosarcoma is an extremely rare nonhematopoietic tumor of the spleen, which is postulated to arise from vascular endothelial cells. Splenectomy is the only definitive treatment, and histopathological examination of the resected spleen confirms the diagnosis. The diagnostic accuracy of fine-needle aspiration cytology (FNAC) for angiosarcoma ranges 15–37%. The cytomorphological features have been well described in breast and liver angiosarcoma. However, literature regarding the role of FNAC in the diagnosis of splenic angiosarcoma is rather scarce. The present case highlights the diagnostic utility of FNAC and immunocytochemistry in the preoperative diagnosis of such a rare and malignant neoplasm arising in the spleen. A 55-year-old female presented with vague upper abdominal pain for 1 year associated with loss of weight and appetite. She had tenderness in the epigastrium and left hypochondrium with mild splenomegaly. There was only mild elevation of serum alkaline phosphatase (154 IU/L, normal = 30–120 IU/L). Hematologically, red cell distribution width (19.8%, normal = 11–14.5%) was increased. Ultrasonography (USG) revealed a large splenic mass and multiple liver lesions. Multiphasic computed tomography (CT) of the abdomen revealed a large heterogeneous arterial enhancing mass measuring 19 × 7 cm replacing the splenic parenchyma along with multiple well-defined liver lesions with peripheral arterial enhancement [Figure 1]a. In the portal venous phase, the splenic and liver lesions showed progressive enhancement [Figure 1]b. On imaging, a diagnosis of splenic angiosarcoma was considered. An ultrasound-guided FNA was performed from splenic and liver lesions using a 23-gauge needle by a team of interventional radiologists and cytopathologists. The smears were stained with May–Grunwald–Giemsa (MGG) and hematoxylin and eosin (H and E). On microscopic examination, smears from both spleen and liver were moderately cellular with dyscohesive clusters and singly scattered tumor cells having moderately pleomorphic, oval to elongated vesicular nuclei, prominent nucleoli, and moderate cytoplasm in a hemorrhagic background [Figure 2]a and [Figure 2]b. Vasoformative features such as anastomosing vascular channels [Figure 2]b and microacinar lumen formation were noted. Cell block also revealed similar morphological features with frequent mitoses [Figure 2]c. There was no evidence of erythrophagocytosis, cytoplasmic vacuolation, myxoid change, or giant cells. The cytodiagnosis was of a malignant neoplasm; although exact categorization was difficult in view of the radiological findings, it was consistent with an angiosarcoma. On cell block immunocytochemistry, the tumor cells showed strong and diffuse membranous positivity for CD34 [Figure 2]d, focal membranous positivity for CD31 [Figure 2]e, focal strong positivity for CD68, strong membranous positivity for CD99 [Figure 2]f, and strong cytoplasmic positivity for vimentin; whereas immunostaining for cytokeratin was negative. Based on the immunochemistry and radiological features, a final diagnosis of splenic angiosarcoma with liver metastases was confirmed. However, in view of metastatic disease and overall poor general health of the patient, surgical resection was not possible and only palliative care was offered. Primary splenic angiosarcoma constitutes 2.6% of all sarcomas and 10% of all splenic tumors. Chemotherapy, radiotherapy, chemical carcinogens, and malignant transformation of benign vascular tumors are implicated in the etiopathogenesis. These patients usually present with nonspecific symptoms. It has a high metastatic potential, and splenic rupture leading to shock is a well-known complication. There is no specific imaging appearance of splenic angiosarcoma. The use of preoperative percutaneous core biopsy is not recommended in majority of the splenic lesions due to the associated risk of rupture and bleeding. However, FNAC plays a pivotal role in the preoperative diagnosis and management in such cases. It is safe and less invasive than core biopsy because it involves the use of a small calibre needle. No major complications were observed in 1000 splenic aspirates with the use of a 22-gauge needle without radiological guidance by Soderstrom et al. Though spleen is a highly vascular organ, the risk of hemorrhage associated with FNAC is small. Lal et al. in a study of 56 cases of FNAC for various splenic pathologies also reported a low complication rate. A retrospective study by Rajwanshi et al. reported no complication in 31 splenic FNACs in cases of splenomegaly with pyrexia of unknown origin. Hence, FNA of the splenic lesion was performed in the case under report with all precautions. In contrast to a core biopsy, FNA has an added advantage of sampling of heterogeneous and more pleomorphic areas as multiple passes can be taken yielding a more representative material, especially in heterogeneous lesions. The cytological diagnosis of angiosarcoma is difficult owing to its variable cellularity, the presence of different subtypes such as classical or epithelioid having varied morphological appearances. Liu and Layfield reported hypocellular smears in 100% cases of angiosarcoma; on the other hand Boucher et al. described moderate to high cellularity in 11 of 15 cases. In the index case, cellularity was good, both in smears and in the cell block, which permitted immunocytochemistry. An interesting, although, nonspecific finding highlighted by Boucher et al. was the presence of vasoformative features such as arborizing microtissue fragments, microacinar structures, intracytoplasmic lumen, signet ring-like cells, erythrophagocytosis, mitoses, and necrosis in 10 of 15 cases. In the index case, we observed microtissue fragments with central vessels along with necrosis and mitosis; however, erythrophagocytosis considered a more specific feature was not evident. Other cytological features described include oval to spindle-shaped cells in small clusters and hemorrhagic background., Epithelioid variant has distinct morphological features such as large cells with indented hyperchromatic nuclei and prominent eosinophilic nucleoli showing expression of both endothelial and epithelial immunocytochemical markers. Various differential diagnoses for angiosarcoma include benign spindle cell lesion and sarcomas such as Kaposi sarcoma, epithelioid sarcoma, and carcinoma. The presence of cellular atypia, necrosis, and mitosis help to differentiate it from benign lesions; presence of vasoformative features favors the possibility of vascular neoplasm. When compared to epithelioid and Kaposi sarcoma, angiosarcoma exhibits more cytologic atypia. As most cellular features are somewhat nonspecific, ancillary techniques such as immunocytochemistry are required for a definitive diagnosis. Delacruz et al. reported the first case of primary splenic angiosarcoma in a 69-year-old female with a history of treated liposarcoma of the buttock diagnosed on cytology, making this case the second case diagnosed by FNA. These cases demonstrated the combined role of cytomorphology and immunocytochemistry to diagnose this rare neoplasm. Various endothelial markers include CD31, CD34, factor VIII, and vascular endothelial growth factor receptor. Both CD31 and CD34 have equal sensitivity, however, CD34 is less specific due to its expression in various other soft tissue tumors. Both the vascular markers were positive in our case although CD34 was strong and diffusely present. Neuhauser et al., in their study, reported that immunoreactivity for markers of vascular differentiation can be occasionally focal and weak, thus highlighting the utility of applying a panel of antibodies. In addition, the primary splenic angiosarcoma usually expresses histiocytic markers such as CD68 which was positive in the present case. Immunopositivity for CD99, an endothelial junction protein, seen in this case, has been rarely described in angiosarcoma, being confined to a single case report of metachronous angiosarcoma of the breast. Thus, we emphasize on the use of a panel of markers for differentiating angiosarcoma from other benign vascular tumors, sarcomas, and metastatic carcinoma. FNAC offers a high diagnostic accuracy for splenic angiosarcoma with minimum risk to the patient. An accurate diagnosis of splenic angiosarcoma can be rendered by a combination of cytomorphology along with cell block immunocytochemistry. Young RJ, Brown NJ, Reed MW, Hughes D, Woll PJ. Angiosarcoma. Lancet Oncol 2010;11:983-91. Neuhauser TS, Derringer GA, Thompson LD, Fanburg-Smith JC, Miettinen M, Saaristo A, et al. Splenic angiosarcoma: A clinicopathologic and immunophenotypic study of 28 cases. Mod Pathol 2000;13:978-87. Soderstrom N. Cytology of infradiaphragmatic organs: Spleen. Monogr Clin Cytol 1979;7:224-7. Lal A, Ariga R, Gatusso P, Nemcek A, Nayar R. Splenic fine-needle aspiration and core biopsy: A review of 49 cases. Acta Cytol 2003;47:951-9. Rajwanshi A, Gupta D, Kapoor S, Kochhar R, Gupta S, Varma S, et al. Fine needle aspiration biopsy of the spleen in pyrexia of unknown origin. Cytopathology 1999;10:195-200. Liu K, Layfield LJ. Cytomorphologic features of angiosarcoma on fine-needle aspiration biopsy. Acta Cytol 1999;43:407-15. Boucher JD, Swanson PE, Stanley MW, Silverman JF, Raab SS, Geisinger KR. Cytology of angiosarcoma: Findings in fourteen fine-needle aspiration biopsy specimens and one pleural fluid specimen. Am J Clin Pathol 2000;114:210-9. Fletcher CD, Beham A, Bekir S, Clarke AM, Marley NJ. Epithelioid angiosarcoma of deep soft tissue: A distinctive tumor readily mistaken for an epithelial neoplasm. Am J Surg Pathol 1991;15:915-24. Delacruz V, Jorda M, Fernandez C, Benedetto P, Ganjei P. Fine-Needle Aspiration Diagnosis of Angiosarcoma of the Spleen. A case report and review of literature. Arch Pathol Lab Med 2005;129:1054-6. Zhoua SA, Weic H, Dinga KR. A Rare Case of Metachronous Bilateral Angiosarcoma of the Breast. Breast Care 2009;4:405-7.